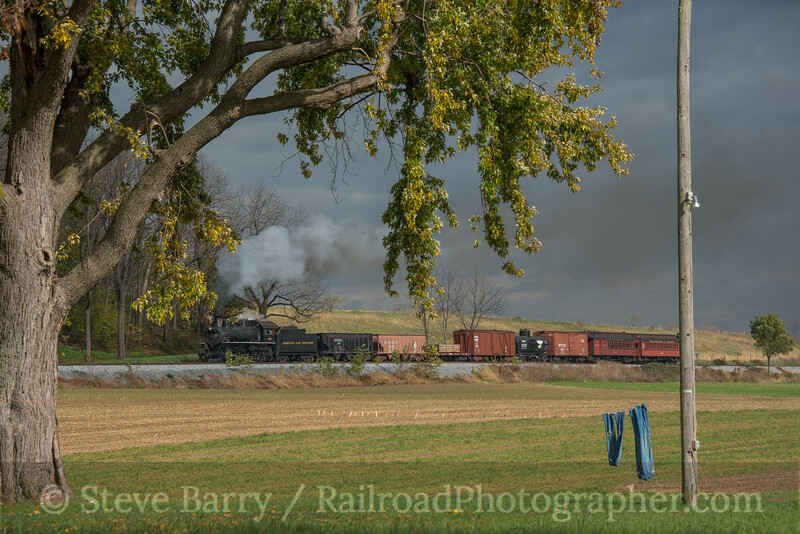 The Abingdon Branch of the Norfolk & Western wandered through the southwest corner of Virginia. It would likely have slipped completely into the dustbin of history if not for one thing, though -- a photographer named O. Winston Link discovered it and documented it on film. Link was more widely known for his night photography on the N&W, but his daytime Abingdon Branch material was just as magical. The locomotive used on the Abingdon Branch during Link's visit was N&W 4-8-0 No. 382. 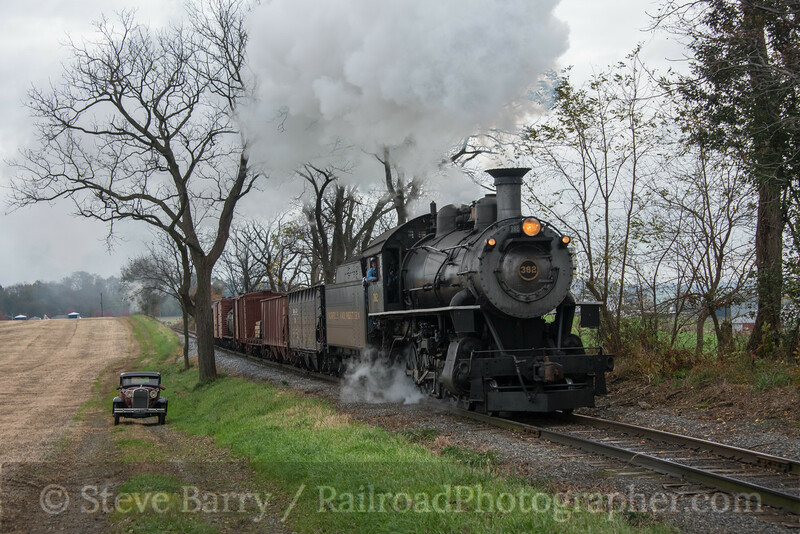 Long-since scrapped, it has a sister locomotive still working on the Strasburg Rail Road in Pennsylvania, N&W 475. 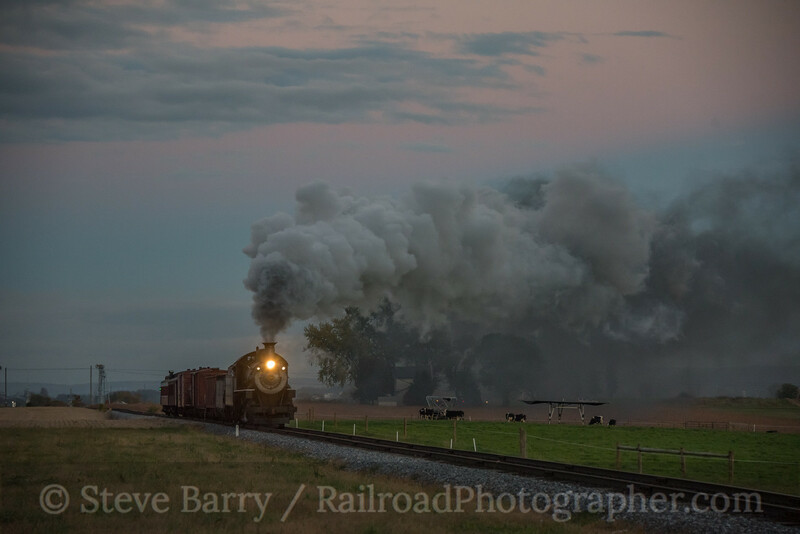 On November 6, 2017, Lerro Productions conducted a photography event at Strasburg that turned the clock back to Link's time, starting before sunrise (above). 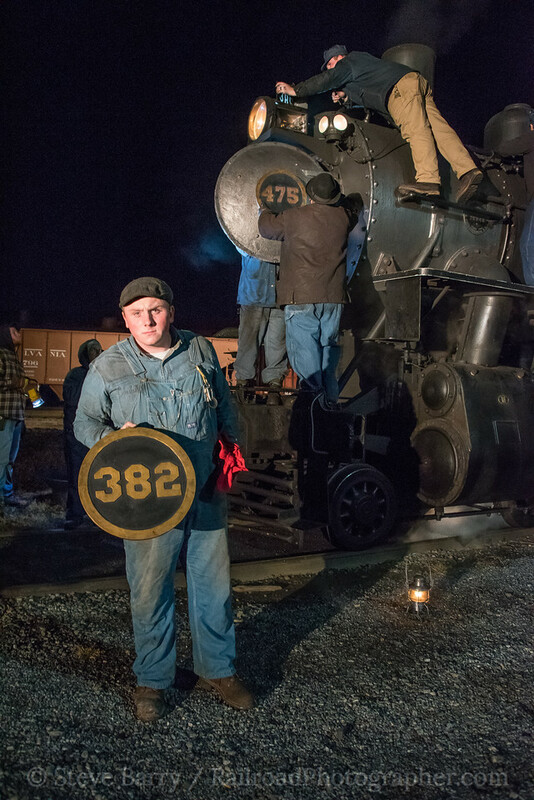 A Model A, owned by Nicholas Brightbill, was brought in to add to the ambiance of old-time railroading. No. 475 was given the identity of the 382 for the day. 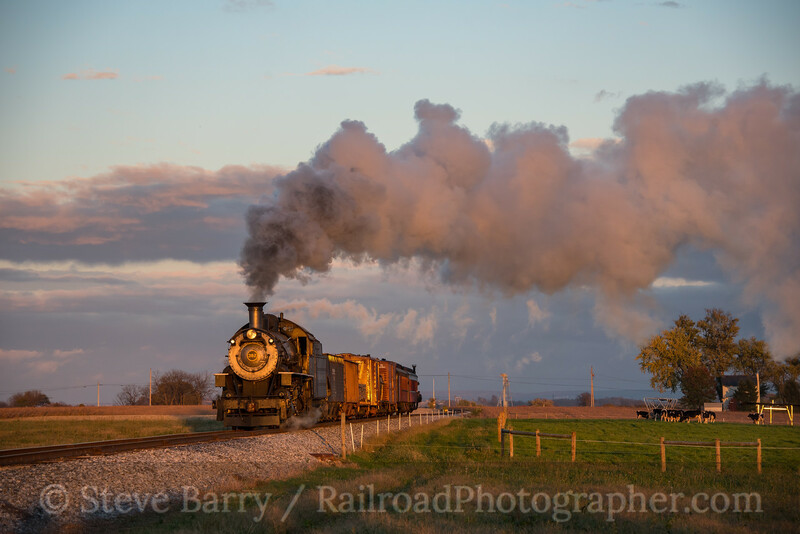 In addition to changing the number, a sunflower spark arrestor was added to the smokestack, a solid pilot (cowcatcher) was fabricated, and the locomotive was given white trim on the running boards. 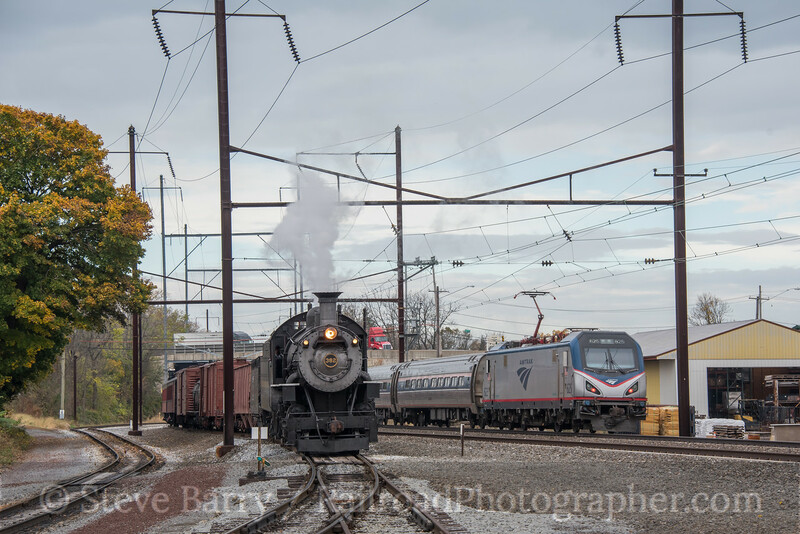 Eras collided at Leaman Place Junction, where the Strasburg Rail Road meets Amtrak's Philadelphia-to-Harrisburg passenger line. The 382 looked a bit out of place as Amtrak ACS-64 No. 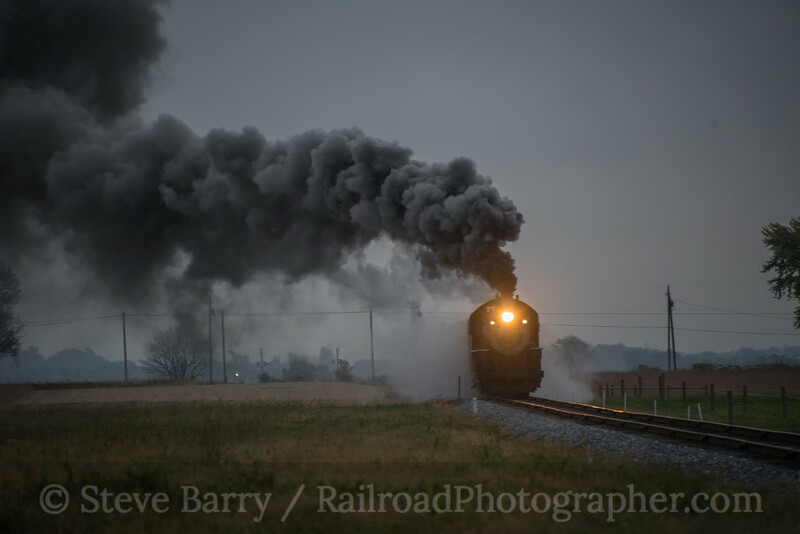 625 pushed a train towards Harrisburg. The lunch break featured some interesting photos from the past, but that's really another topic for another day (a lot of good imagery came out of the lunch break). After lunch, our N&W mixed freight-and-passenger train caught a bit of sun at the railroad's picnic area, Groff's Grove. 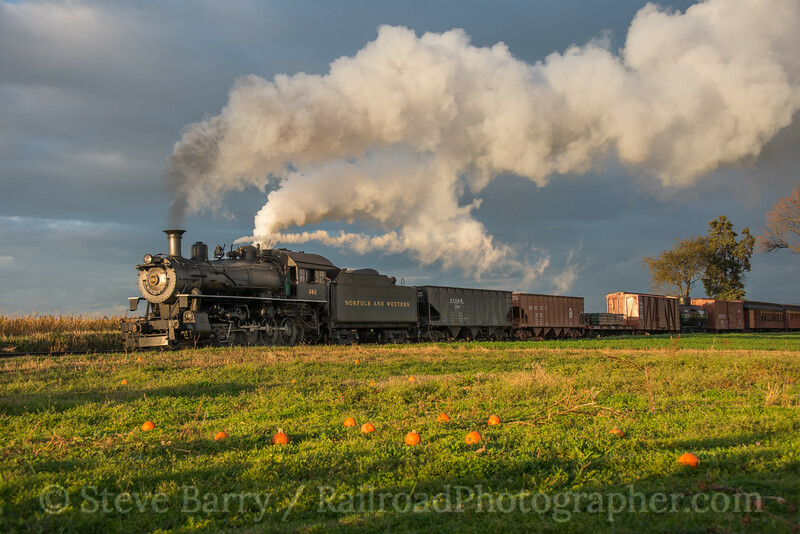 The rural nature of the Strasburg Rail Road was put to good use. 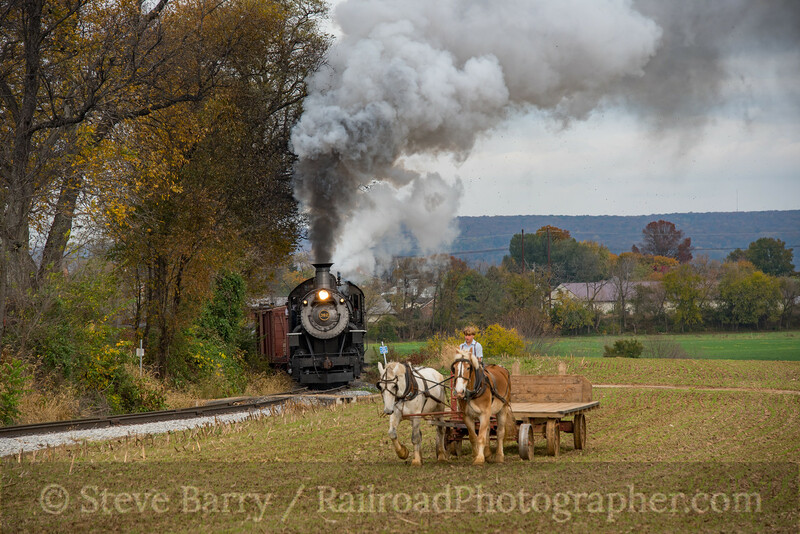 The railroad is located in Amish country, and scenes included an Amish farmer working his team of horses (top of this post). Some pumpkins that escaped Halloween were still in the field at Esbenshade Road. 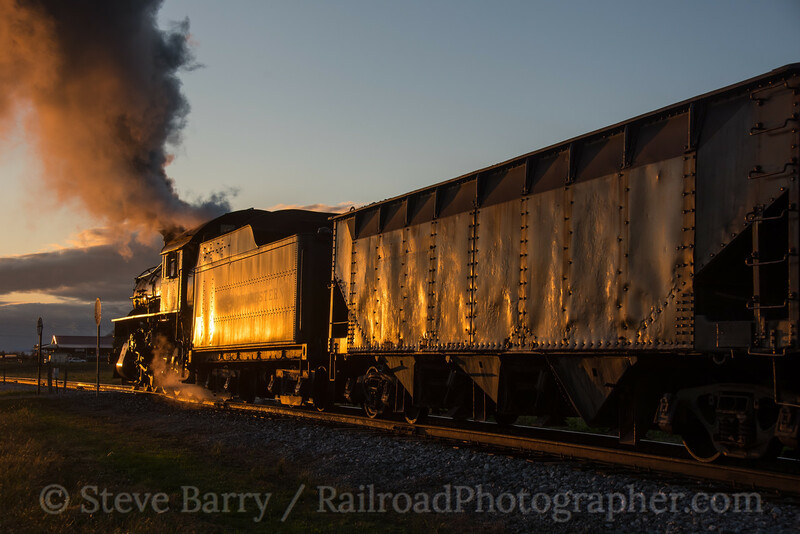 Sunset brought a warm blow to the engine and train as it worked its way into the setting sun at Ranck's Crossing. Turning the other direction yielded some nice evening glint off the side of the train. Even after the sun went down, the sky still had a tinge of color in it. No. 382 made one last pass before darkness moved in. Once it was dark, No. 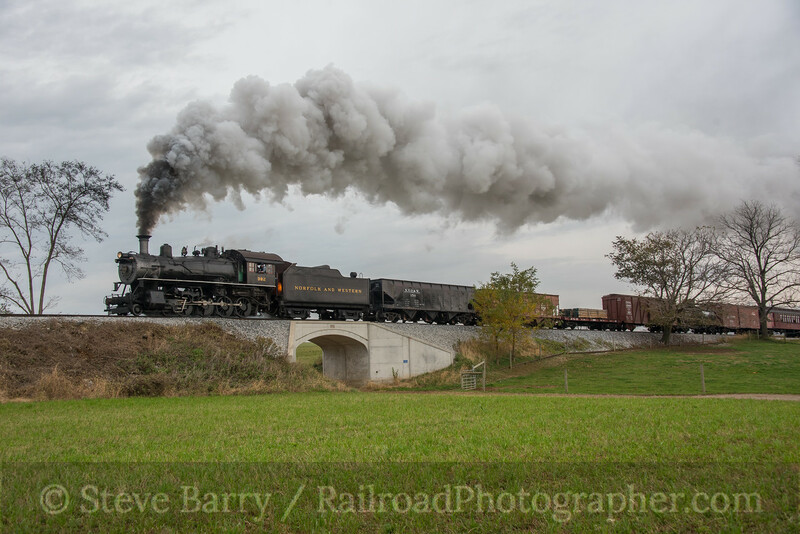 382 posed for a few photos in the Strasburg Rail Road yard (below). Then it was time for Cinderella to vanish back into history and No. 475 return back to its true identity. Alex Merrill of the Strasburg puts No. 382's number plate away as 475 reappears in the background (right). All in all, it was a magical day of bringing back O. Winston Link's world. 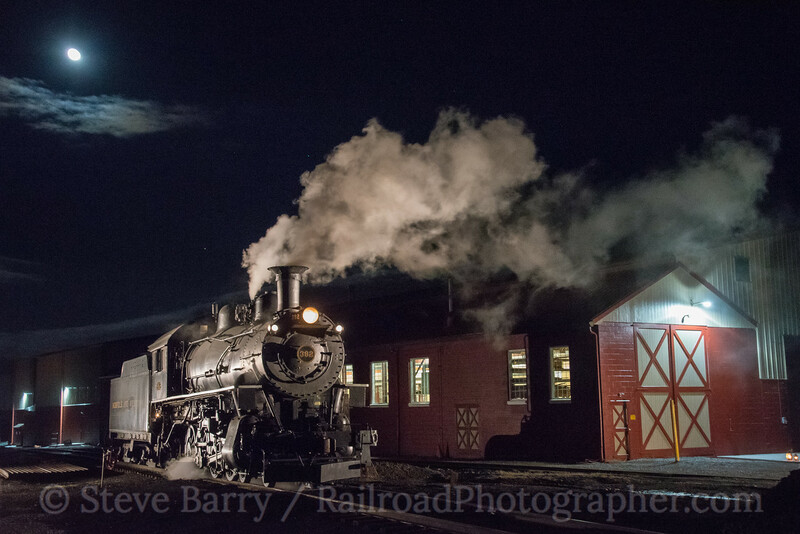 Thanks to Pete Lerro and the staff of Lerro Productions for another outstanding photo charter. As mentioned above, Lerro Productions provided some great photography during the lunch break during this day, and we'll visit that in our next post.